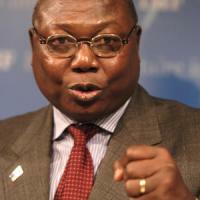 Martin Ziguélé is a Central African politician who was Prime Minister from 2001 to 2003. He is currently the President of the Movement for the Liberation of the Central African People. Martin Ziguélé (born February 12, 1957) is a Central African politician who was Prime Minister of the Central African Republic from 2001 to 2003. He placed second in the 2005 presidential election and is currently the President of the Movement for the Liberation of the Central African People (MLPC). Ziguélé was appointed as Prime Minister on April 1, 2001 by President Ange-Félix Patassé, replacing Anicet-Georges Dologuélé. He had previously lived in Lomé, Togo for twenty years and was an executive member of the MLPC. He left office when rebel leader François Bozizé took power upon capturing the capital, Bangui, on 15 March 2003. Ziguélé was allowed to go into exile in France. Ziguélé was initially barred from running in the 2005 presidential election, along with six other candidates, by a court ruling on December 30, 2004. He was subsequently reinstated as a candidate by Bozizé, along with two other candidates, on January 4. Later in January, all barred candidates, with the lone exception of Patassé, were allowed to run; following this, Patassé's party, the MLPC, backed Ziguélé for the election. Previously, he had been running as an independent. The election was held on March 13, 2005, and Ziguélé came in second with 23.5% of the votes according to official results. He faced Bozizé in a second round of voting, and tried to distance himself from Patassé in campaigning, but was defeated and took 35.4% of the vote.